Jimmy Johnson brags that back in the day, back when the Muscle Shoals Sound Studio was firing on all cylinders, he recorded a new album every week. 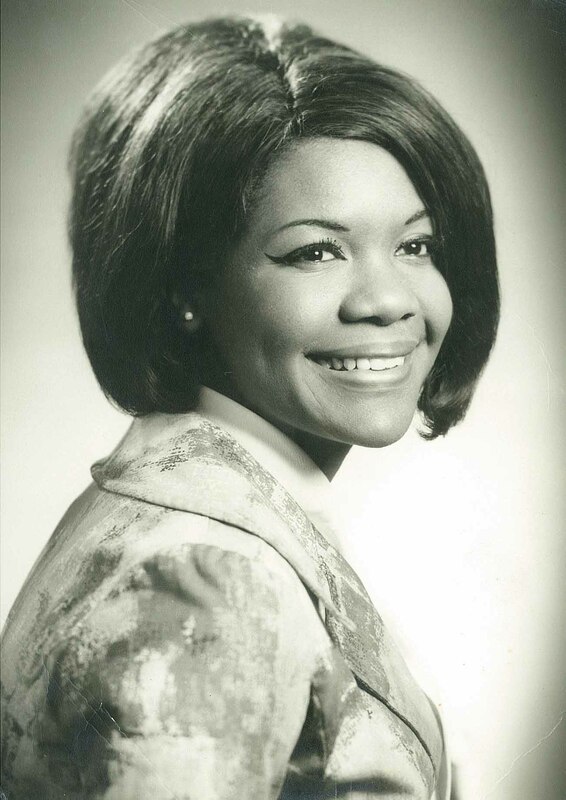 Jimmy stayed in demand as both a music producer and sound engineer, but he was also the versatile guitarist for the sound studio’s legendary house band, famously called “The Swampers.” I contacted him recently, and we spoke about Annette Snell, the R&B singer who died in the Southern 242 plane crash on April 4, 1977, just hours after completing her first recording session at his studio. Johnson remembered her quite well, and recalled her powerful drive and enormous talent. We also spoke about his talented younger brother Earl, an engineer who tragically lost his life in the same plane crash. CD: Today is Sunday the 23rd of March, 2014, and I am here at Jimmy Johnson’s home studio in Sheffield, Alabama. Mr. Johnson, thank you for taking the time to speak with me today. Tell me how the Muscle Shoals Sound Studio came to record Annette Snell in late March/early April of 1977. JJ: We got a call from Epic Records. One of the vice-presidents there wanted my partner Roger Hawkins and I to produce a record for this up and coming singer. So we listened to her and we were thrilled to get a chance to work with her. She flew in and we cut four songs, and…it still makes me sad. Of course, we didn’t get to finish the songs until after her funeral. It was very hard, but we did – we finished it, all of the embellishments, the mix, everything. It was very hard to hear, knowing she was no longer alive. And she had such a great talent. I think that anybody who hears her songs will agree to that. CD: Describe your first meeting with Annette. JJ: Some of our staff picked her up at the airport and brought her to the offices, which is where I first met her. At the time she came here, all of the hotels were booked, and so I brought her home with me. It was very nice – she stayed with me and my wife for a little over a week—she commandeered one of our spare bedrooms (laughs). We all became real close. And then she got on the doomed flight. My brother Earl, who was five years younger then me, he was also on the flight with her, but I didn’t know it at the time. He was a very successful engineer, and he had been traveling for business. I only found out he had been on the plane after it had crashed – but we knew that Annette had been on that flight. CD: Did she bring any songs with her when she arrived at the studio? JJ: No. You see, everybody that worked with us knew that we had writing teams. It was just like going to Motown or anywhere else, we had writing and publishing teams on staff. If you went to Atlantic Studios in New York to record there, Jerry Wexler always had tons of writers with fresh material. CD: What kind of expectations did you have? JJ: Well the thing is, she had won the award as the artist most likely to succeed the year before in Cash Box, and so we were very excited – Cash Box was similar to Billboard, one of the music trade magazines. And then when she arrived at the studio, it didn’t take us but a few minutes to realize just how full of talent she was. I remember that after the crash, her mother was having problems getting a decent settlement from Lloyd’s of London. So I wound up going to the federal courthouse in Atlanta, and I testified on behalf of her and her mother as to how talented she truly was, and what our expectations were for the album we had just started to record. Her lawyer came first, and he “qualified” me in front of the jury, so they knew exactly who was talking. He didn’t spare anything (laughs). He basically gave them the history of my biggest hits with The Swampers–I know it made a difference because they increased their offer. JJ: Our original name was the “Muscle Shoals Rhythm Section.” One day the boys from Lynyrd Skynyrd – a band that I was the first to discover, sign, and produce–were recording with us at 3614 Jackson Highway, and they were looking at all of the gold records on the studio walls. 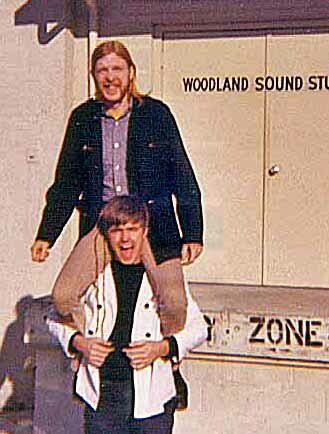 They saw that two of the records were not made out to the Muscle Shoals Rhythm Section like the others, but they were made out to “The Swampers.” You see we had recorded Leon Russell, and his producer was a guy from England named Denny Cordell–he had been a big record man in London before he decided to come to America. But Denny had decided that we needed a better name than the one we had. Later on, when he presented us with the gold albums on Leon–and he didn’t tell us this beforehand–he just used “The Swampers.” That’s what he felt we should be called. And so that’s the name that the Skynyrd boys used in their song. The name was based on all the water around here, the Tennessee River, you know that kind of thing – and it has inspired a lot of our music. People have always asked, “Why did it happen here? Tell us why?” And we would say, “It’s in the water! (laughs)” But we were honored to be a bunch of southern rednecks who were able to play so many different types of music. Most people thought we were black musicians, and they could not have given us a higher compliment. CD: Tell me a little bit more about the session you had with Annette. Were you working with any other artists that week? JJ: I always work with one artist or group at a time. Basically, every Monday morning we would get a new act. And that was Annette’s week. So we started on that Monday morning, and we began cutting tracks. We did four tracks, and we got all her vocals and a few of the overdubs. We did that in about three days. And then she just stayed on, and we took more time on the vocals. She stayed over the weekend, and on Sunday night she asked me to put her on the first flight home to New York. And tragically, I did. CD: And so she spent Sunday night at your house, and then left for the airport on Monday? JJ: Okay, this was one of the two songs that they never released, although we felt that it could have been a great single for her. It was written by George Jackson – he also wrote “Old Time Rock and Roll” and “One Bad Apple.” And I really felt that it was the most commercial song we had – she did a splendid, super job on it. The others, it’s not that they couldn’t have been hits, but I think this song had the most potential. CD: Who did you bring in on the session? JJ: Well, first we used the Muscle Shoals Rhythm Section to play on it. And then we brought in the Muscle Shoals Horns. And background was a girl by the name of Ava Aldridge. She was the arranger, and she had a group of about three or four people. She was truly dynamite, and she was also a songwriter for us as well. I don’t think we used any of her songs during that week, but I know this: Before we would have finished the album, she would have had a cut or two (laughs). The guitar guy, I think it had to be Pete Carr, and he worked along with the four of us on the tracks. And the arranger for the strings was a guy named Mike Lewis out of Criteria Studios in Miami. JJ: The first thing we did…although she came in on Monday morning, she had gotten there a couple of days earlier, and I remember we started looking over the new material as soon as she arrived. I also wanted her input on what she liked. We never tried to make an artist sing a song they didn’t want to sing. (L-R) Carolyn, Erma, and Aretha Franklin, with Aretha’s husband Ted White. 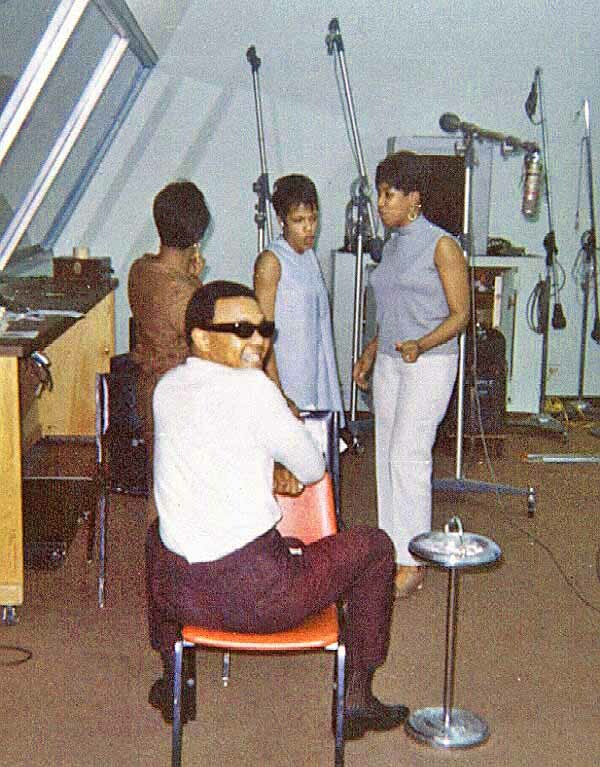 The Franklin sisters are working out the “Sock it to me” vocals during the recording of the song Respect at Atlantic Studios in New York City on February 14, 1967. CD: Was it typical for an artist to come in a couple days early like that? JJ: We required that. Now a guy like Paul Simon, he wouldn’t have to do that. He would come in the same day (laughs). He would fly in from New York at maybe 7 o’clock in the morning, connect into Nashville and then bam! right here. We would get into the studio around 11 o’clock – we started most sessions around 11 – and then we’d work ‘till about 6:00 and take a supper break. And then we’d come back around 7:00 or 7:30 and work until about ten or eleven. That was kind of the usual day. CD: She also recorded “It’s All Over Now.” What do you remember about that song? JJ: I don’t know why I picked that title. I think if I had known what was going to happen, I probably wouldn’t have picked that one. It’s pretty ironic, don’t you think? But it worked not knowing what was going to happen, so I wouldn’t change a thing. I think the two songs that were released were the Jerry Weaver songs, “Promises Should Never Be Broken” and “It’s All Over Now.” What was the other song? JJ: That might be a Philip Mitchell song. He was one of our top writers. Do you remember “Starting All Over Again” – he wrote that one. Well, like I said, we did all four tracks in about three days, and then we kept her for another day or two to finish up, so she worked through Friday to get the vocals like we wanted them. And then we might have done a few solo parts, some guitar fills. On “Tonight I Feel Like Dancing” I believe we did most of Roger’s percussion work, including tambourine and that kind of thing. CD: Describe what happened on Monday afternoon after she left to go back to New York. JJ: We had another person coming in – it was Peter Yarrow of Peter, Paul, and Mary. So he came in and we started the session, and that’s when I got the shock of my life. In the afternoon, right after the crash, one of the secretaries came in and she told me, “Your mother is on the phone and she’s screaming!” My mom had just found out that my brother was on the plane. It was…it was just a real shocker, because all of a sudden, you know, immediately my thoughts went to my brother, but then, very quickly, I realized we had also put Annette on the same flight. CD: What did you do after the accident? JJ: We immediately went to Atlanta. My parents and I…we drove over to Atlanta, to Grady Hospital, to the burn center there. And we stayed there until he passed…and that was a very traumatic deal. Of course by then they had already…I don’t know if I should tell you this…they never found Annette. They said she might have been vaporized – but they never found her body. That’s another thing that really bothered me about Lloyd’s of London, trying to pay her as if she were a tiny baby, with all the talent she had, and how vibrant she was. She was so full of talent. To us, we felt like she had a big future ahead of her. When I went over there and testified, it was my job to let them know how great she was. They wouldn’t let me play her music – Lloyd’s of London refused to let me play it. I wanted to, because I’d a had `em. But I had `em anyway, so it didn’t really matter. I was real shook up about it…not only because I was there for Annette, but because I felt like I was there for my brother, too. CD: Tell me a little bit about your brother. JJ: Earl was an electrical engineer, and he was at the top of his field. He went to Auburn University and got his degree there. My parents couldn’t afford to send him to Auburn, and so he got his first year as a scholarship, and then went on the co-op program, where he would go to school for a quarter, and then work for a quarter. It took him about six years. When he graduated he was a certified engineer, which is the best you can be. He immediately got a job with GE up in Schenectady, New York where he stayed for about a year or two. Then he moved to Murray, Kentucky to the GE factory there. And then he came back to Muscle Shoals to work for Reynolds Aluminum. He started building and designing electrical systems for their gigantic plant here. He was really something. He was five years younger then me, and he was my baby brother. CD: What happened to Annette’s songs after the crash? JJ: After we got back, we contacted the guy from Epic who had signed us up to do the project – don’t forget, Epic was a subsidiary of Columbia Records. We had a productive conference with him, and they arranged for us to go ahead and finish the tracks. They did put out two singles, and I guess it was partly for that reason, but I would like to think that they were also doing it to honor her. They didn’t put up any kind of proper budget to promote her – that just wasn’t their way of doing things. If the artist isn’t alive, the only way they would have promoted her was if she had been an established singer with big hits. Then they would have promoted her in a big way because they could have gotten the sales, gotten the returns. CD: How soon would you have brought her back to Muscle Shoals for the next session? JJ: She would have probably been back within 60 days, as soon as we could have worked her into our schedule. Like I said, we were booked way in advance, but we would have made room for someone like her. She was that special. 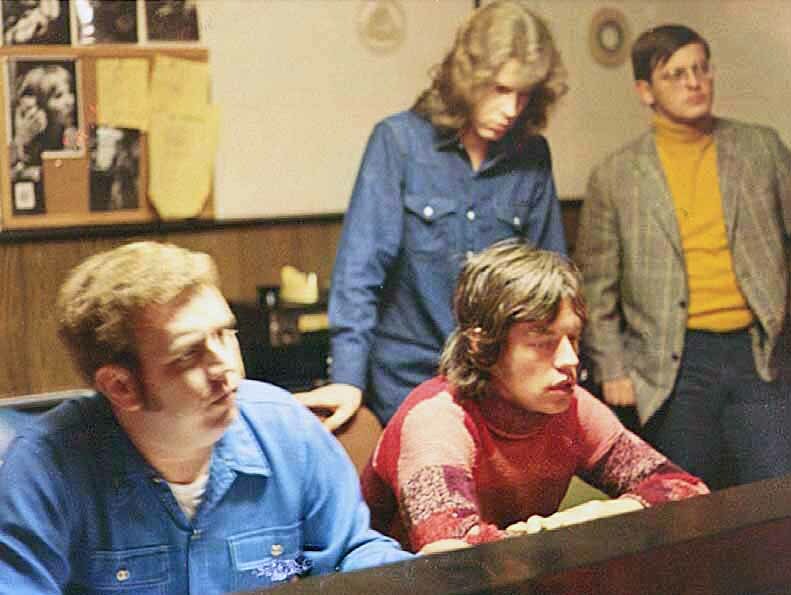 (L-R) Jimmy Johnson, Mick Jagger, Mick Taylor, and Terry Woodford at work in the Muscle Shoals Sound Studio. The Rolling Stones recorded Brown Sugar, Wild Horses, and You Gotta Move from December 2nd-4th, 1969. CD: I know we’ve touched on this before, but what was it that gave The Swampers such a unique sound? JJ: It’s all in the water, right? (laughs) I don’t know…all of us had been playing together for such a long time, and most of us had been really heavily into rhythm and blues music. Later on, even after we had started cutting country and just about everything else, my first love was always rhythm and blues. Artists like Chuck Berry, Jimmy Reed – you remember him, right? Do you remember Bo Diddley? Those are the people who inspired me to play, and to get involved. First we started doing their music live, and then we started playing the fraternity circuit at colleges all over the southeast. We started playing their favorites, and it was usually R&B. They wanted to hear black records too. Whatever they wanted to hear, we learned it and we played it. CD: After all these years, you still live in the old neighborhood. How close are we to the house where you and Earl grew up? JJ: We’re right behind our old house, you can see it right through that window (laughs). This studio used to be my aunt’s house – she was my daddy’s half-sister. And my uncle lived right across the alley, and he was in the music business. My mother and daddy both played guitar, and they both sang together, but my dad played professionally. Daddy and my uncle used to play on the radio all over Arkansas and Alabama, at all sorts of different places. But he never did any recording until we did an album on him. My son and I did an album on him when he was 80 years old, and it’s a real piece of work. I’ll have to let you hear a little taste of it before you go. He was into country and western growing up. CD: Tell me a little about your recent involvement with “Muscle Shoals,” the documentary that was released last year. JJ: Well, the documentary, it’s about the history of the area and its music, and it came about when a couple of guys were driving through the area and decided to stop off and have a look – it was two years into the filming before I found out who they were. The producer was Steven Badger – we knew his name, but later on we found out that his mother is one of richest women in the world. She is a Mars…as in Mars candy. So Steven Badger came through, and his friend Freddy Camalier became the director. “Muscle Shoals” is the story of Rick Hall, his adventures in the music business, and how we fit in around Rick. We wound up going into business against him, which was kinda tough at one point. If you see the movie, you’ll see the bitterness that developed, at least that’s how he felt when we left him. But we always respected and admired him because he gave us a chance to be in the business. And being from Redneckville, Alabama, it wasn’t easy getting into the music business (laughs). CD: I guess you’re a little bit off the beaten path here. JJ: It’s true, but I’ve always been kinda disappointed that they never invited me to a reunion – I have always felt left out. Why they didn’t include me I do not know…maybe it was just miscommunication. But it sure didn’t help my feelings any, because I would have loved to have gone over and talked to those people. I guess maybe we can find out next weekend. CD: Are you planning to come out to the memorial service in New Hope? JJ: I’m planning on it, next Sunday March 30th, a week from today. Can you give me directions? I’m not really sure on how to get there. CD: I can help you with that – and thank you for the interview. 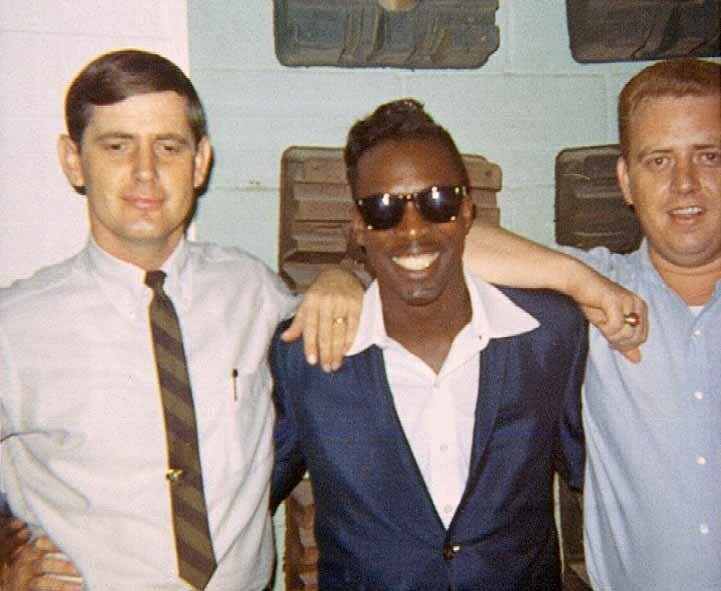 Rick Hall, Wilson Pickett, and Jimmy Johnson at Fame Studios in 1966 during the Land of 1,000 Dances session. This entry was posted in Muscle Shoals Sound Studio and tagged Annette Snell, Ava Aldridge, Jimmy Johnson, Muscle Shoals Sound Studio, Rick Hall, The Swampers. Bookmark the permalink. Cliff, what an amazing story, very interesting and captivating. Thank you! I love Jimmy Johnson, he is so interesting!! Thanks for posting this, I really loved reading it.